Polaroid Which? Ad 1968 This is a December 19, 1968 advertisement. 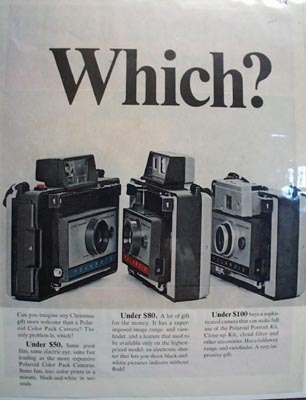 It is a nice two page, color ad from Polaroid. Shows six different models and prices, to choose from and it reads ""Which?"" In excellent condition. Photo is taken through plastic and may show wrinkles or crookedness that is not in the ad. This magazine tear sheet measures 10 1/4"" wide by 13 1/4"" tall. 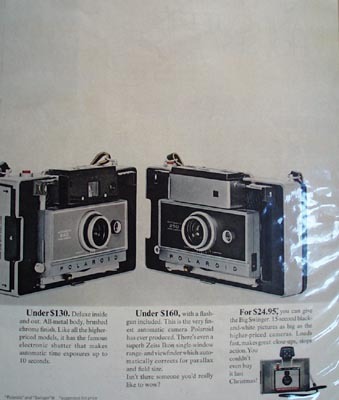 Items Similar To "Polaroid Which Ad 1968"